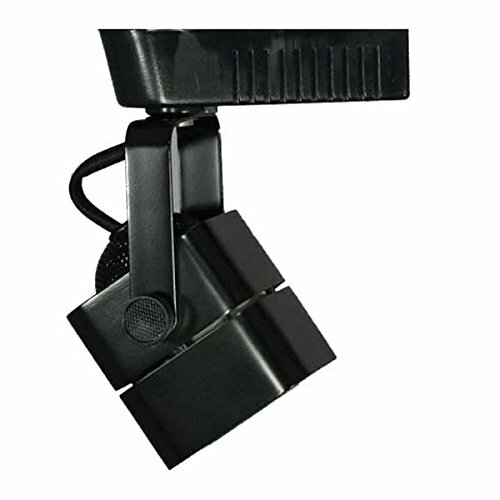 The Juno Trac-Lites Cast Cube Track Light offers a unique fixture shape that is compact and contemporary. Adjustable 90 degrees vertically and 358 degrees rotationally, it provides exceptional task and accent lighting when installed on the economical Juno Trac-Lites system. The die-cast aluminum housing and die-formed steel yoke are finished in bronze, producing a fixture that is both durable and attractive. It snaps into place easily thanks to its spring-loaded locking latch and it can be independently controlled with its integrated on/off switch. It uses one GU10-base twist-lock PAR16 light bulb (sold separately) for potent overhead lighting. 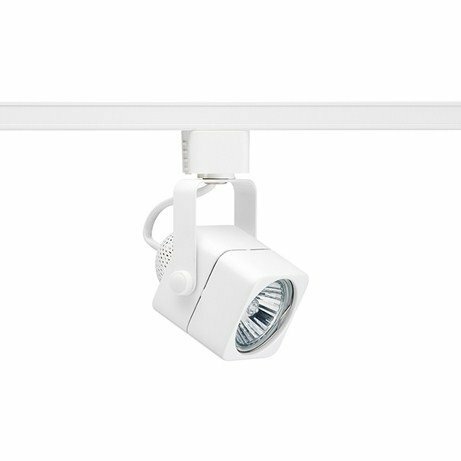 Max LED bulb length from bulb face to end of bi-pin is 2" Direct-Lighting HT-50012-BK cube MR16 50W low voltage track lighting provides an excellent source of illumination when a concentrated and precise beam of light is required. 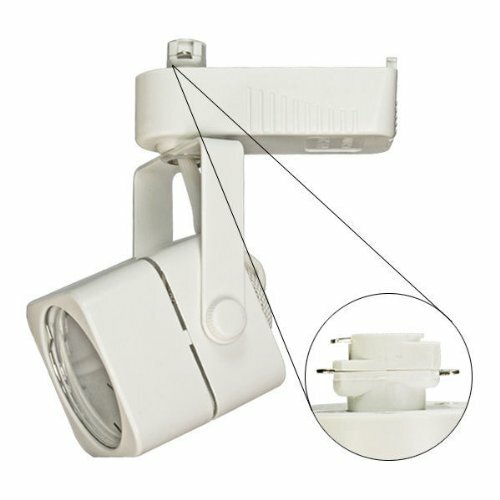 This track head is an ideal accent lighting choice for retail store lighting, gallery lighting, display lighting, task lighting, product highlighting, and residential lighting purpose. The color of this fixture is black, the body is made with steel stamping and the transformer located inside the polycarbonate case. The attached 12-Volt electronic transformer can be used with dimmers that support 120V electronic low voltage transformer. The swivel arms provide 350-Degree horizontal rotation and 90-Degree vertical projection. This light comes with a MR16 lens holder clip that can be used for spread lens, dichotic filter lens, linear spread lens, or honeycomb louver lens (specialty lens and light bulb are not included). This track head works with any typical H system aka 3-wire-1 circuit track system. Max LED bulb length from bulb face to end of bi-pin is 2"
Type: LED Ceiling LightFeature: Square Rubik's CubeStyle: ModernFinish: Baking PaintLight Color: White lightLight Direction: DownSuggested Room Fit: Living Room, Bedroom, Study Room, Kitchen, OfficeSize: L15.75×W15.75×H3.94 inchesBulb Base: LEDVoltage: 100-240VWattage: 24WLight sources Included or Not: Including the light sourceMaterial: Iron,AcrylicColor: BlackWeight: 6.5 poundReturn Policy: All non-defective, undamaged and unused products must be returned within 1 month after you received.Please return it in original box if you don't need/want it. ORIGINAL SHIPPING COST WILL BE DEDUCTED FROM THE REFUND.And BUYER need to PAY the RETURN SHIPPING FEES.If the product is damaged or defective when you receive, please feel free to contact us. We will REPLACE it FOR FREE or provide a refund. 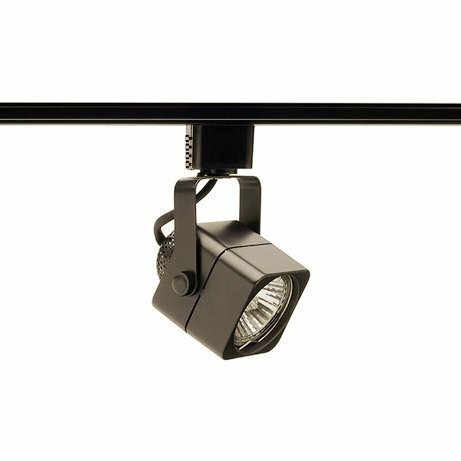 Get track lighting the easy way with this four light track-style fixture. The design installs into a ceiling junction box just like any other ceiling light, so installation is easy. It features four glass cubes with LED lights that offer a cool contemporary look. The LEDs are comparable to a 75 watt incandescent bulb, but use only 18 watts of energy in total, so it is very energy efficient. With chrome finish details that add to the sleek look.- 34 1/2" wide x 12" high overall. Canopy is 4 3/4" wide x 2" high. Weighs 4.01 lbs.- Four built-in non-dimmable 4.5 watt LED modules: 1250 lumens. Comparable to a 75 watt incandescent. 3000K. 80 CRI. 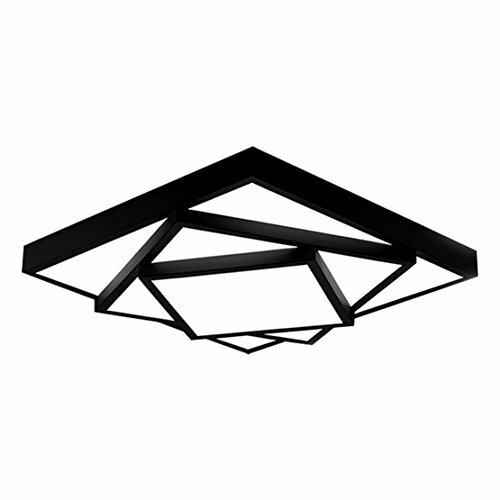 110 volts.- Contemporary four-light energy-efficient LED track fixture by Possini Euro Design®.- Track lighting style fixture - easily installs in a junction box like any ceiling light.- Chrome finish. Glass cube design. LEDs average lifespan of 25,000 hours when used 3 hours per day. Summit series track and rail heads are the perfect replacements for halogen mr16's as they offer lower wattage with superior lumen output, over 10 times the rated life span, less maintenance, no projected heat, and beamshift technology in-field changeable beam angle. All summit series track luminaires are equipped with beamshift technology, allowing in-field modification of beam angle with no additional tools or accesories simply by changing the location of the lens. For use with 120V track. Track fixture is available in h, j/J2, and L track configurations. Order according to track layout specifications. 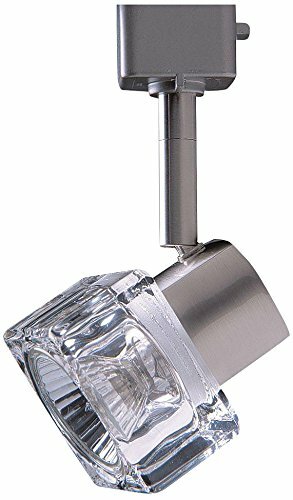 Kendal Lighting TLGU-12-SN Designers Choice 1LT 120V GU10 Track Head will complement many decors with modern flair with a sleek Satin Nickel finish and Clear Cube glass shade while providing 50W of directional crisp white halogen illumination. The TLGU-12-SN is 2.5IN deep x 3IN wide x 6.5IN tall, and requires one (1) 50W (maximum) 120V GU10 base halogen lamp, dimmable using a standard incandescent dimmer. 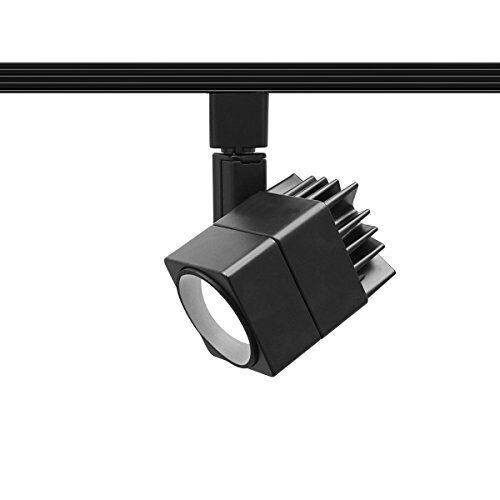 The TLGU-12-SN comes one per package, and can only be used on Kendal Lighting Designers Choice collection of track. Kendal Lighting Inc. was established in 1985 as a leading edge Ceiling Fan provider bringing new designs to the marketplace. Our catalogue of lighting ideas has since expanded through the consistent addition of new and innovative products. Today, Kendal Lighting quality and design can be found in many areas of Lighting including Fans, Fixtures, Lamps, Track Lighting and Rail Systems.